Marisa Alemany ’20 takes a swing at a pitch during the team’ss three-game sweep of Colgate this past weekend. The Bison softball team resumed Patriot League play at home on April 6-7 against the Lafayette Leopards. After sweeping the Leopards in a three-game series, the Bison are 9-0 in the Patriot League for the first time in program history. The Bison beat Lafayette in their doubleheader on Saturday by final scores of 8-0 and 9-1, with each game only going five innings. The Bison also won game three on Sunday against Lafayette by a final score of 2-0. The Orange and Blue are the only team in the conference still undefeated in Patriot League play. A week after her historic no-hitter against Lehigh, Raeanne Geffert ’20 pitched a shutout in game one of the series. Geffert allowed only three hits and struck out eight in her five innings of work. The Bison scored in all four innings at the plate. Taylor Wolfgang ’21 was the only Bison to hit an extra-base hit in the game. The team was able to score mostly on singles and stolen bases. Five players for the Orange and Blue had stolen bases, while six logged singles. Lauren Lichtenwalner ’20 pitched for the Bison during game two and only gave up one hit. Lichtenwalner allowed no walks and struck out four. 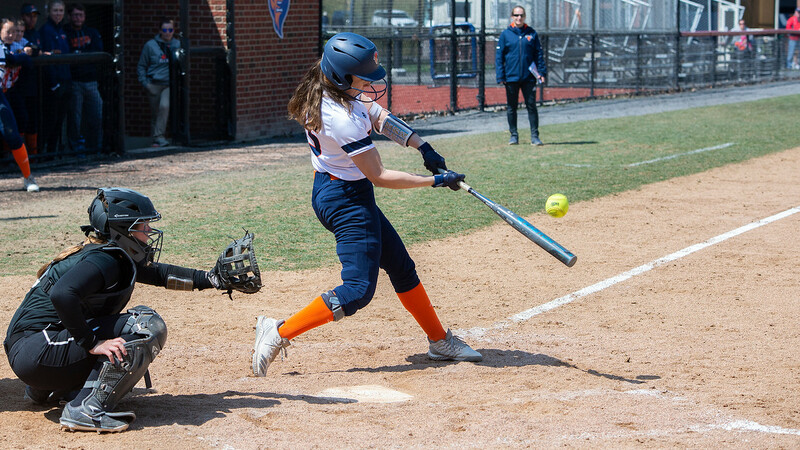 Allyse Volpe ’22 went 4-4 at the plate, going on to score three runs for the Bison. Volpe raised her batting average to .410, a team best. Also going 3-3 at the plate was Marisa Alemany ’20. Alemany hit a double and a triple, scored three runs, and collected three RBIs. Ryanne Rokos ’19 had a triple, while Lauren Hadley ’19 and Wolfgang each added doubles. Geffert pitched game three of the weekend and struck out a career-high 15 batters, not allowing a hit until the seventh inning. The Bison scored the first run of the game in the bottom of the third inning, then went on to score their second run during the fifth inning on a triple from Wolfgang setting her up to score on a Jess Hom ’21 RBI. Over the course of the two days, Geffert only allowed the Leopards four hits, struck out 23 batters, and did not allow any walks. This is the third time the Bison have swept a three-game series this season. On April 10, the team competed in a non-conference doubleheader against Mount St. Mary’s. Geffert pitched a one-hit shutout in the first game, leading the team to a 2-0 victory. Unfortunately, in the second game of the series, the Bison fell by a final score of 5-4, ending their ten-game winning streak. The Bison will next head to Holy Cross for another three-game league series on April 13-14.